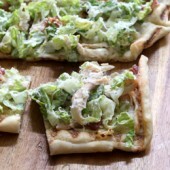 A classic Caesar salad turned into an incredible and flavorful grilled pizza. Heat water to 115°F. Dissolve yeast and sugar in water, allowing to proof for at least 5 minutes. Add flour, salt and garlic powder to a large bowl or stand mixer, using the dough hook attachment. With mixer running on low, slowly add yeast mixture. Continue mixing until dough just begins to pull together. Drizzle in olive oil and continue mixing. Shape into a smooth ball and transfer to a lightly greased bowl. Cover and allow to rise until doubled in size, roughly 1 hour. Meanwhile, cook and chop bacon. Cook chicken breast, shredding and seasoning with salt and pepper to taste. Prepare cheese and romaine, setting aside until ready to proceed. In a small bowl, combine olive oil, red pepper flakes and minced garlic. Microwave for 20-30 seconds or until warm and fragrant. Toss romaine in Caesar dressing. Mix in half of the bacon and chicken. Preheat gas grill with all burners on high for 10 minutes. Pizza will be grilled over direct medium heat. Reduce additional burners to low. On a lightly greased baking sheet or cutting board, shape dough to desired size. Lightly grease one side of the dough. Carefully, transfer dough to preheated grill. Do not adjust dough once it is on the grill. Close grill and cook 3-4 minutes. Remove dough, flipping uncooked side down onto a lightly greased baking sheet. Generously spread garlic oil over entire surface of cooked dough. Sprinkle with half of the chicken and bacon, followed by shredded mozzarella cheese. Return pizza to grill, closing the lid and cooking for an additional 3-6 minutes or until desired crispness is reached. Top off with coated romaine lettuce, chicken and bacon. Sprinkle with freshly grated parmesan cheese and ground black pepper, if desired.